Designer brings flair for fashion to Fruit Market. A talented designer is to bring his flair for fashion to the creative community in Hull’s Fruit Market with the launch of his first business. Fashion and footwear designer Shaun Barker-Newton will open the doors to contemporary lifestyle store 19point4 in Humber Street this weekend. The store will offer an eclectic range of menswear, womenswear and homewares, as well as an exclusive custom-made collection of clothing and home accessories designed and created by Shaun. Shaun said: “I can’t wait to open 19point4. The Fruit Market is an amazing place, with a really great buzz about it. “19point4 is all about injecting a bit of humour into our fashion and homeware lines and keeping things fresh with regularly-changing products. “I’ve been very careful to find brands which are exclusive to this region – I want our clothing lines to be different to anywhere else in Hull. 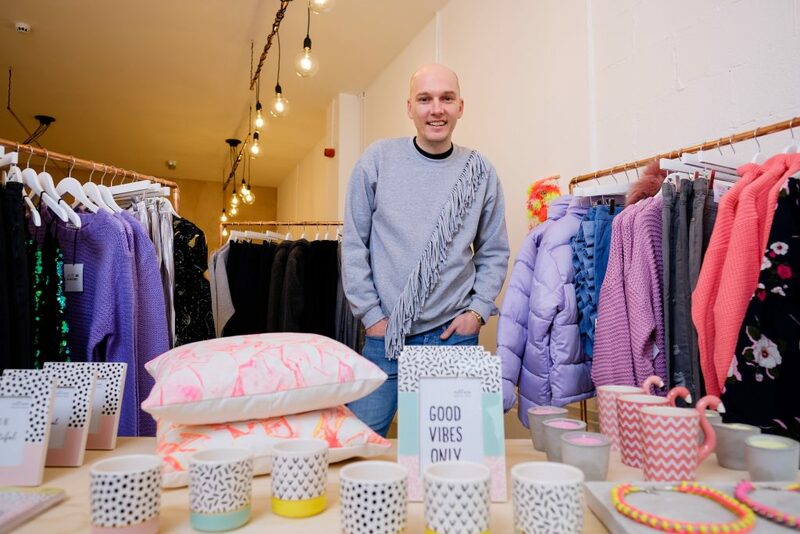 “I’ll also be designing and making a range of limited edition fashion pieces and creating bespoke home accessories instore, so 19point4 will be very different and complement the other stores in Humber Street. Shaun studied fashion and design in Leeds before relocating to Hull to design clothing and shoes for Cottingham-based fashion boutique Bourne. Shaun began exploring business opportunities by selling his own designs on online platform Etsy. Then, when his role with Bourne was made redundant, it was the perfect opportunity to realise his long-held ambition to strike out on his own. Clothing brands stocked by 19point4 will include Manchester-based womenswear brand Glamorous and independent menswear brand Bellfield. Quirky homeware products will include cushions, candles and decorative accessories by brands such as Sass and Belle and Chickidee, as well as a small range of textile art and costume jewellery created by Shaun. The new 727 sq ft fashion and lifestyle store will have an industrial style with white walls, bare concrete floors, copper accents and hanging foliage. Shaun added: “We’ll be having a bit of fun with our homeware products and everything we stock will be affordable. “Our clothing will be aimed at a wide target audience with many unisex pieces. We’ll have a broad range of daywear and more glamorous evening wear, but styled in an unconventional way. 19point4 is the latest independent, creative venture to join the ever-growing community in the Fruit Market as the area undergoes a remarkable transformation. The rejuvenation of the area is being driven forward by Wykeland Beal, the regeneration company formed by commercial developer Wykeland Group and housebuilder Beal Homes, as part of the Fruit Market LLP joint venture with Hull City Council. Tom Watson, Development Surveyor for Wykeland, speaking on behalf of Wykeland Beal, said: “We’re delighted Shaun has chosen the Fruit Market as the place to open his new business and we wish him every success. For updates follow @19point4 on Facebook and Instagram. Be the first to comment on "Designer brings flair for fashion to Fruit Market."